Founded in 1910 by Carlos Avery & Sam Anderson. The 1st Meeting of the Gopher Campfire Club was held on April 11,1911 at the Commercial Club in Hutchinson, MN for the purpose of organizing the club. A report was given by the committee on organization regarding the proposed constitution along with the various articles it contained, and their proposed changes. It was stated and adopted that changes could be made by a vote of 3/4 of the members present with no less than 25 members being a quorum. It is also interesting to note that a field day or annual camp be held this coming season. These officers along with 2 other members of the club, became known as the ‘Club Council’. Their job was basically set up committees and get things accomplished. One of their 1st orders of business was to recommend to the State Game and Fish Dept. that Elrey Williams be retained as Game Warden for the community. In July of 1911, the Club Council met at Breezy Point Resort on Lake Jennie (known today as Provencher Point on the SW corner of the lake) to make plans for the 1st Annual Gopher campfire Outing to be held on July 25 & 26, 1911 at Belle Lake. 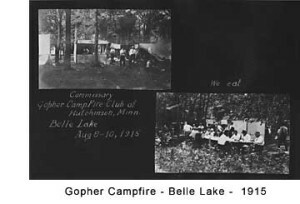 The Annual Meeting of the Gopher Campfire Club was held August 4, 1913 at Belle Lake. The Club Council went on record to offer a $5.00 reward for information which would lead to the conviction of any person for killing harmless and insectivorous (depending on insects for food) birds in this vicinity or game birds out of season, or for discharging revolvers or rifles in the city limits of Hutchinson. It was noted that there have been many complaints of wanton shooting of Robins and other harmless birds. The Club Council also went on record as favoring the establishment of a public bath house near the mill by the dam. Men and boys want to bathe in the river and there is no place for them, without trespassing on private property. On Tuesday, March 29, 1927 a final draft of the Gopher Campfire Game Refuge around the city of Hutchinson was forwarded to the DNR for final approval. Final plans were made at the April 13th, 1927 meeting for the annual crow hunt, and that it be divided into 2 sides, Otto Zella (Captain of the east side) and Harry Betker (Captain of the west side). Every hunter is to meet at Dr. Burne’s Cottage on the west side of Belle Lake at 1:00pm for a feed and also to make a report of crows. Prizes to be awarded to the ‘High Bird Man’ & ‘High Egg Man’. There will also be a consolation prize.